Skipper Sam Morsy reckons Wigan Athletic could easily be in the top half of the Championship table had the footballing gods been with them this term. Latics return from the international break against Brentford on Saturday, with work still to do over the last eight games to confirm their place in the second tier for another campaign. Their most recent win, a 5-2 triumph over Bolton on March 16, lifted them a couple of places to 19th, three points clear of the drop zone. 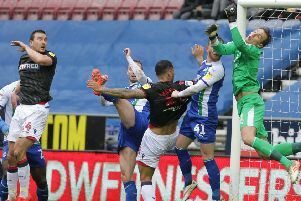 And Morsy says the manner of the victory – including sparkling displays from the likes of fit-again Nick Powell, Michael Jacobs and Gavin Massey – showed their league position is misleading. “You look at the amount of points we’ve dropped this season, that we shouldn’t have,” Morsy told the Wigan Post. “You look at the injuries to key players, which have cost us in other games. “We could easily be 10 places higher in the table – and that is not an exaggeration. The Bolton game was Morsy’s third in a row without a yellow card, after boss Paul Cook revealed he’d spoken with his captain to try to prevent a third suspension of the campaign – which remains just two cautions away. “It’s just trying to cut out the silly ones really,” acknowledged the Egypt international. “To be honest, it’s not something you can be thinking too much about. “It is what it is, and hopefully it won’t be a problem for the rest of the season. “It’s just horrible watching games from the sidelines, when you know you’d be playing.